Ahmedabad which is known as the "Manchester of the East" was the capital of Gujarat from 1960 to 1970.Ahmedabad took part in various Indian independence movement during early 20th century. Most of the monuments in the city are all a blend of Muslim and Hindu styles of architecture. There are number of temples of all religions in and around the city. Ahmedabad is housed by one of the best textile museums in the world, Calico Museum where you can see the finest fabrics and weaving machines produced in different parts of India since early 16th century. They have got the maximum number of vegetarian restaurants. The city of Ahmedabad is located in north-central region of Gujarat. It is more on the banks of river Sabarmathi. Ahmedabad which s now one of the most busiest and modern city in the state of Gujarat was founded by Sultan Ahmad Shah in 1411 AD. The city got extended more on the planes towards the East of river Sabarmati. During the Mughal reign, Ahmedabad became one of the empire's thriving centres of trade, especially in textiles, which were exported as far as Europe. A famine in 1630 devastated the city. In 1753 , the armies of the Maratha generals Raghunath Rao and Damaji Gaekwad captured the city and ended Mughal rule in Ahmedabad. The famine of 1630 and the rule of the Peshwa and the Gaekwad virtually destroyed the city. The British East India Company took over the city in 1818. Navratri Celebrations - This festival is celebrated in the months of September-October. All the nights of navratri are celebrated with great enthusiasm by dancing and wearing new clothes depicting their religion. Uttarayan Celebrations- The festival of Makar Sankranti which falls on 14th of January is celebrated here as "Utarayan" or festival of kites. On this day people fly kites thus making the sky very colourful and it is also continued in the night by attaching lamps to the kites. Akshardham - This temple is about 28kms from Ahmedabad is featured by sandstone carving. Ambaji - This temple dedicated to Goddess Amba and Lord Krishna is about 179 kms from Ahmedabad. Dwarka - This one of the renouned place of pilgrimage associated with lord Krishna and is about 441 kms from Ahmedabad. Somnath Temple - This is a famous pilgrimage site of India, featured by one of the 12 Jyotirlingas of Lord Shiva and is about 412 kms from Ahmedabad. Siddi Saiyad’s Mosque - This mosque is located near Lal Darwaja, towards the north-west corner of the Bhadra Fort. This architect is a blend Hindu and Muslim architecture. It is very famous for its yellow stone tracery, especially the Jali screen, framed, in ten semi-circular windows. The mosque is situated near Mahatma Gandhi Road in the heart of the city. It was built in Indo- Saracenic style of architecture, said to be the most beautiful mosque in the East. It is featured by the Royal Gallery having a platform standing on pillars and enclosed up to the roof with beautiful stone work. St Francis Xavier Catholic Church, situated in Navrangpura, Ahmedabad are few of the churches in this city. Bhadra fort is the one which tops the list of monuments in Ahmedabad which is never missed by tourists. 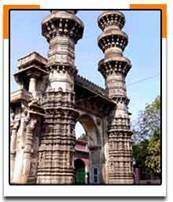 It was built in 1411 by the Maratha ruler, Sultan Ahmed Shah who is the founder of Ahmedabad city. This is a well built around 1501 to serve the travellers with cool water and a place for relaxation. It is just not a well but it is very elaborately and beautifully designed well. It is located very close to the tomb of Dada Hari. This place though initially was a part of the mosque Siddi Bashir was constructed with swaying minarets and the city is mainly known for this craftsmanship. It is built in such a way that if you apply a little force on its upper arc, the Minar tends to sway. This place was dedicated to a Muslim religious leader, Sultan Ahmed Shah.Sarkhej Roza has a number of monuments which dates back to the history of Mughal rule in Ahmedabad.It is situated at about 8 kms from the south west side of Ahmedabad. Teen Darwaza, one of the oldest gateways of the Ahmedabad city is known for its splendid architecture. It leaves most of the tourists with a spell bound feeling. The arched gates are gorgeous and involve lot of workmanship. This was also established by Sultan Ahmed Shah, the founder of Ahmedabad. 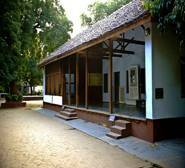 Sabarmati Ashram which is a colony popularly known as Satyagraha Ashram or Harijan Ashram during Gandhiji’s period. It is the second home of the father of nation from where he started to fight for the countries freedom. In this ashram Gandhi's cottage,“Hriday Kunj”is still very well maintained preserving all his valuables like round eye glasses, wooden sleepers, his personal letters, books and spinning wheel etc. There is also a small museum,” Gandhi Smarak Sangrahalay” which has things lot to talk about Gandhiji.It is from this ashram the most famous and the historic dandi march started. 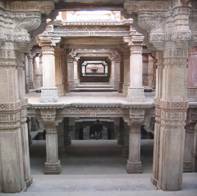 The Adalaj step well or baolis was built by Queen Rudabai in 1499 for the travellers and the dwellers to quench their thirst during summer. It is situated 19 km north of Ahmedabad. This place is very much associated with the Indus Valley cities of Mohenjodaro and Harappa and it is more of archaeological importance. It is about 80 km south of Ahmedabad towards Bhavnagar. This is a home of special migratory birds-ducks, goose, pelicans, and flamingoes. The best time to visit this lake is from November to February. 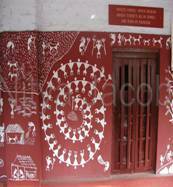 This place is known for its famous Patola silk saris and it has nearly 100 Jain temples in and around this area. 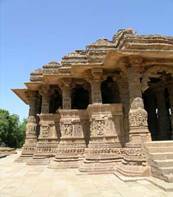 It is in the north-west of Ahmedabad and is about 120km from the city. 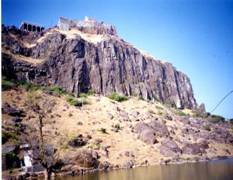 The hill of Pavagadh rise in three stages from Champaner.The plateau at an altitude of 1471 feet is known as Machi Haveli. The two points on the hill are named after Goddess Bhadrakali and Mahakali.This is located in the Panchmahal district and is about 190 kms from the city. This mosque is known for its intricate and elegant work of a stone. This is also noted for the style in which it is worked on a stone like a tree with palm leaves and curving tendrils. This is also one among the best monument located in Gandhinagar.It is fully constructed with pink sand stones. This cultural complex has a 7 feet gold leafed idol of Lord Swaminarayan. In this ashram Gandhi's cottage, “Hriday Kunj”is still very well maintained preserving all his valuables like round eye glasses, wooden sleepers, his personal letters, books and spinning wheel etc.Gandhi Ashram is situated on the Sabarmati river. Gandhinagar, the capital of Gujarat is about 32 kms north east of Ahmedabad.It is a very well planned city trees and large recreational areas along the river giving it a fresh, green garden city atmosphere. It has the famous Swminarayana temple. This jain temple which is built of pure white marbles with rich carvings in it, is located near the Delhi Gate. This temple is dedicated to the 15th Jina, Dharamnath. Is one of the finest mosques in India with 260 pillars supporting 15 domes at different elevations. Built by Ahmad Shah in 1423, the Masjid is located in the center of the old city. The main features of this lake are that it has an island garden along with a summer palace in the centre. This was constructed by in by Sultan Qutub-ud-Din in 1451. Calico museum is located in the verdant Shahi Bagh Garden. This museum has a display of very rare materials and textile items like royal tents, carpets and costumes; religious paintings on cloth, embroiders, brocades, Kashmiri shawls and silk weaves. The museum was established by Sarabhai family, leading textile mill owners and philanthropists of Gujarat. It also has history exhibits like Mughal Tent, Sharad Utsav Pichhwai, Phulkari, Telia Rumal, Kathiawar embroidery, Mughal costumes etc.This museum is closed on Wednesday. The Utensils Museum gives you a chance of getting back to the life and lifestyles of past eras. It is located in Vechaar Vishalla Environmental Center, opposite Vasama Toll Maka. There are no foreign embassies located in Ahmedabad, but the nearest one is in New Delhi. Ahmedabad - 380 013, INDIA. Dhal Garwad - saris, dupattas, bedcovers, etc. Ahmedabad is very well connected from other parts of the country by excellent rail routes. The national Highway from Gujarat to Ahmedabad is very well maintained by the government and it connects all the major cities of Gujarat. Apart from the government and private travels you can also drive down by luxury cabs or taxis from other parts of the state.